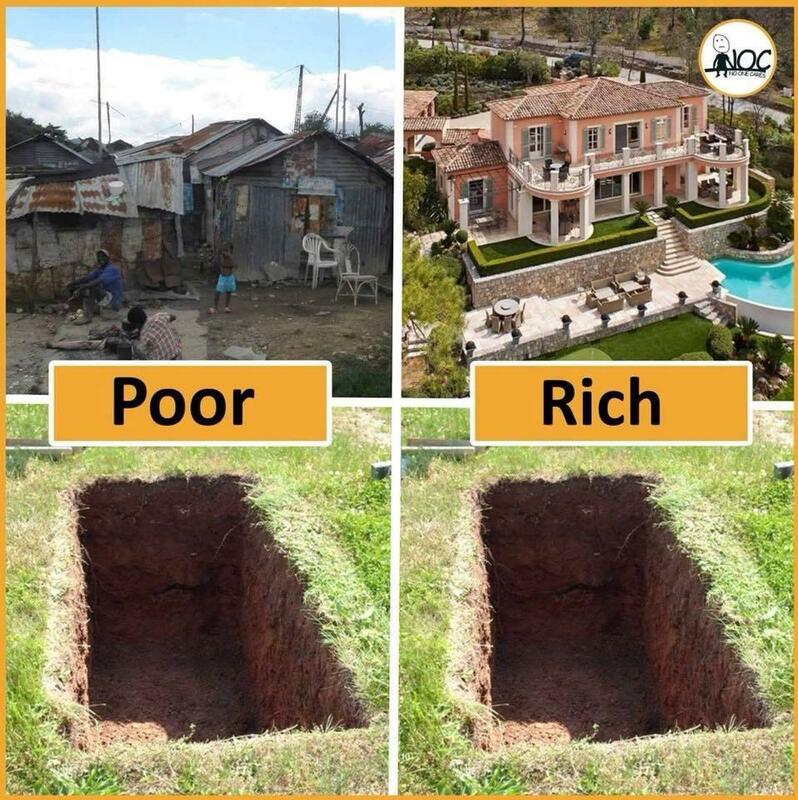 HOW BIG YOUR BANK ACCOUNT IS, OUR GRAVES WILL BE THE SAME . A wise Man and a wise Woman will read if those verses say what will be of us? They say what you do not know will not hurt you - wrong! If you no read this page will hurt you regardless - if you read or not read. You must read now you saw the page you have no more excuses! - It Will SAVE U! Read Those Beautiful Verses Will Tell You Where We ALL GO! 2 Multitudes who sleep in the dust of the earth will awake: some to everlasting life, others to shame and everlasting contempt. 3 Those who are wise[a] will shine like the brightness of the heavens, and those who lead many to righteousness, like the stars for ever and ever. About if is true what those verses say what will it be of us? A wise Man and a wise Woman will read it and cherish in His/hers Heart and follow the Lord Here – For if is Not True what the Bible say we lose NOTHING! - BUT if we do nothing about it and when we get placed 6 feet under we find out that what the Bible say is true, then our eternal disaster is inevitable and we have no excuses before the White judgment throne of the Almighty God READ! 8 Cush was the father[a] of Nimrod, who became a mighty warrior on the earth. 9 He was a mighty hunter before the Lord; that is why it is said, “Like Nimrod, a mighty hunter before the Lord.” 10 The first centers of his kingdom were Babylon, Uruk, Akkad and Kalneh, in[b] Shinar. [c] 11 From that land he went to Assyria, where he built Nineveh, Rehoboth Ir,[d] Calah 12 and Resen, which is between Nineveh and Calah—which is the great city. Note: The Great City is the Babylon of all religions they are confused about God, He did not speck to them Jesus Came to save us not to institude a religiouse belief - be WISE!! “Come out, my people! Come out from her! you must not share in her punishment! and God remembers her wicked ways. pay her back double for all she has done. as the drink she prepared for you. ‘Here I sit, a queen! So please Click Here and become a born again today! – Let me tell you that happen to me 3 days before I went to the hospital – One morning while I was in prayer and meditation of the word I heard the devil accusing me before God, he said to God "let me inflict cancer in his voice he will curse you in your face" I answerd never never I will deny my Lord who has been good to me, and three days later i got up in the morning and i could not breath i was taken to the hospital and the Doctor placed a tube in my neck so i could breath, she tested what i had in my vocal cords and it was cancerouse - BUT God who knows me and all things He allowed this to happen to me for three reasons: one= to prove the devil he is a liar - two= to strengthen my faith - three= God knew that trough my trouble I would have not stopped talking of Jesus to people and that i would had meet more people in my life including you today. Are you a Police, a Firefighter, a Doctor, a Nurse? Then know this: you are working for God to help humans in their trouble, hardship, diseases, and other bad things inflicted to men by the devil because of sin. But know this that as good as you think you are if you do not confess to Jesus you are a sinner to receive the pardon of your sins you too will land in hell, as i saw one day in a vision given to me by the Lord - there in hell were all kind of Men who thought they were good people and in no need of this Jesus, He Jesus came from heaven to earth to pay the debt for our sins by his sacricrificial death, he rose again on the third day ashented in heaven and set down at the right hand of God to justify us before God when we call on him in confessing our sins. He came and do only but good to all of Us Rom 3:10-26, . As I was writing this letter the Holly spirit give me witness in my heart that what I am writing is the truth. SAVE this website and hold the words to your heart. I do not know how long more i live but I know where I am going, Jesus will be welcoming me in the gates of paradise. The reasons things are hard here on earth is because the devil rules over the government and the government oppress the people making themselves rich – instead of the government to serve us they serve themselves and that is part of men deciding for God or for themselves, in the end at judgment day those people in the government if they are not saved they will be accompanying their father devil in the lake of fire and forever in torment Mk 11:42-48, Lk 13:28. But for those who have been saved will receive eternal life and live with God, Christ and the Holly Spirit in the new heaven and new earth that God will recreate at the end of this era of men, God had a plan from the beginning and He is overruling all activity of men that will go according to his plan Isa 14:24-27, Dan 4:34-35, Rev 21:1-8.